Johnny is from Indianapolis, Indiana. He is the father of seven children, four boys and three girls, and the husband to a beautiful wife. Johnny is passionate about becoming the best human being he can be. His hobbies include cutting hair, cooking, exercising, and listening to classic R&B. Serving an unfortunate prison term and being away from his family inspired Johnny to make positive changes in his life. He received a high A grade in the ASU Inside-Out Prison Exchange class. With great class participation, he brought excellent viewpoints during the criminology course, enlightening inside and outside students. This earned him a position in the ATP, a program that assists and furthers the Inside-Out program. Inside-Out has allowed Johnny to evolve into someone who wants to make a difference in the lives of others. Being a part of the ATP continues to impact him by allowing him to continue his passion of being the best person he can be. Johnny advises anyone doing time or facing a difficult situation to stay strong, keep an open mind, be positive, and seek any avenue to further your learning. Oh and one more thing: pray. Justin spent his childhood years growing up in Vernon Hills, IL with his twin sister and loving parents. He enjoys skiing, snowboarding, golf, scuba diving, and traveling the world. Justin moved to Arizona, where he attended and graduated from Arizona State University. He earned a B.S. degree in global business and later a Master’s in Business Administration (M.B.A.). Justin is extremely passionate about his philanthropic efforts. He volunteered for several organizations: St. Bernadette Catholic Church as a Life Teen leader, Phoenix Children’s Hospital during Christmas, UMOM reading books to kids, Andre House feeding the homeless, and Young Life Capernaum working with teens and adults with special needs. Justin planned and co-hosted a charity event at Grand Canyon University for those teens and adults, providing them the celebrity treatment. They were dropped off at a red carpet by a stretch limousine with paparazzi waiting to snap their photos. The event successful raised enough money to send 12 teens and adults on a week-long vacation where they experienced things they might have never had an opportunity to experience otherwise. Justin believes his biggest accomplishments were the simple things he did, volunteering his time. Khan is 39 years old and the proud father of a teenage daughter. He is passionate about water conservation and strives daily to be the best man that he can be. He has recently discovered that he enjoys writing. Khan is currently working on writing a book that he hopes will one day be published. He attributes this new found hobby to the Inside-Out Prison Exchange program. Shaun is a native of Phoenix, AZ. He is the profoundly loving and proud father of six adult children, two young ladies and four young men. For almost 15 years of incarceration he has striven daily, putting forth the diligent effort to become the very best version of himself. A great deal of this was achieved through self-reflection, soul-searching, and the reading of self-help books. Although Shaun only possesses a GED as his highest level of achieved education, he has always held a deep desire to learn, as he terms it: ” a thirst for knowledge.” In an attempt to satisfy this ceaseless craving, he enrolled and actively participated in the Spring 2017 Inside-Out program at East Unit. The experience opened his eyes to the vast world of criminology, and the knowledge he gained has left him with a passionate desire to effectively bring about change within our legal system. Being accepted into the ATP has been humbling beyond words. It has given Shaun a home so to speak, a sense of belonging to something that counts. The opportunity to learn here is endless because of the intellectual wealth which he is now surrounded by. Most importantly, it gives him a place where he can share his thoughts and ideas with like-minded people, which ultimately expands his ability to grow as a person. Timm is a definition of overcoming a negative and turning it into a positive. He first and foremost loves Jesus Christ as his Lord and Savior. This relationship has been the catalyst to Timm seeing positive in the situation he has faced for 21 ½ years. He has taught a class called “Positive Parenting” for the past 9 years and has seen over 1,200 men graduate. Timm is also very passionate about seeing his peers turning their lives around and understanding that their children and families are very important and need them! He is looking forward to seeing the Arizona Transformation Project making a difference for both inside and outside communities and is honored to be a part of this program. Timm is passionate for change and looking at ways every day that he can continue to become a better man. Varrone was born into a good loving family on January 6, 1981 at Luke Air Force Base Hospital in Arizona. Although his parents did their best to raise him right, he turned to a life of crime in his early teens, in and out of juvenile hall, which ultimately led to him receiving two prison terms totaling 21 years when he was 20 years old. Since then, he has given his life to Jesus Christ and desires to help troubled youth to not go down the same path he went down. He loves teaching, thinking outside the box, listening to and making music, good humor, good conversation, encouraging those in need, and bringing an awareness to the very real impact crime has on its victims. Upon release, he hopes to be able to speak to teenagers in juvenile correctional facilities and become a mentor. Cody is originally from Charlottesville, VA and after going to graduate school in the Washington, DC area has been an assistant professor in the School of Criminology and Criminal Justice at Arizona State University since 2013. His research largely focuses on the police and how researchers can work with police agencies to maximize fairness and effectiveness. Outside of work, he spends his time exploring Phoenix, following politics way too closely, and hoping for the University of Virginia football team to eventually have a winning season. He is excited to co-teach his first Inside-Out course in Spring 2017 and is thrilled to be part of the ATP. Kevin is from Rochester, NY and has lived in Maryland and Washington State prior to settling in the desert. He is an associate professor in the School of Criminology and Criminal Justice at ASU, and his work focuses on improving the correctional environment for those working and living in prison and improving the opportunities for those formerly incarcerated. He’s a semi-active hiker, a terrible photographer of nature, and an even worse fly fisherman. His chocolate lab Redford is staring him down as he writes this because it’s time for a W-A-L-K.
Travis is originally from Green Bay, Wisconsin and is a doctoral student in the School of Criminology and Criminal Justice at Arizona State University. He is currently working on his dissertation exploring violence in prison and alternatives to restrictive housing and disciplinary segregation. In his free time, he enjoys reading crime fiction, biking, and binge watching documentaries. Travis co-taught the first Inside-Out course in the state of Arizona and is a founding member of the Arizona Transformation Project. Visit the Arizona State University School of Criminology and Criminal Justice Inside-Out page for more information on the course and information for students on how to apply. The ATP was excited to have Professor Sarah Allred visit in December 2017 to conduct a focus group as part of a national project on Inside-Out think tanks. 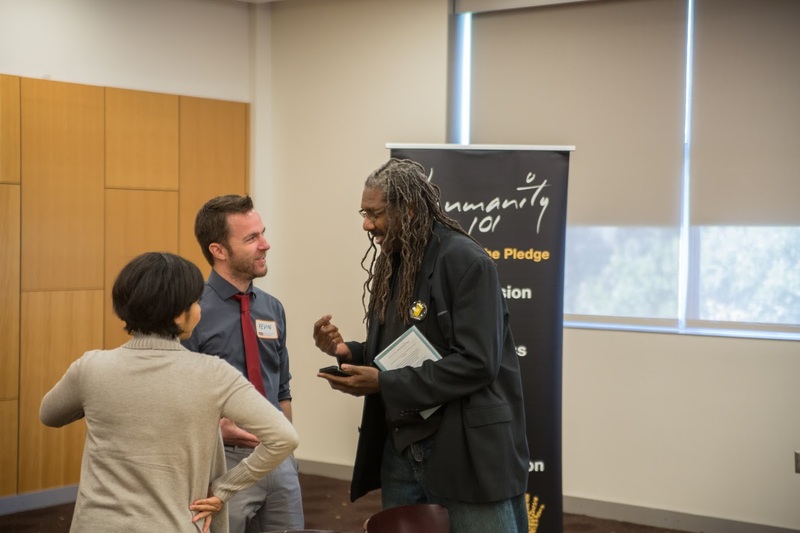 The Inside-Out Prison Exchange program at ASU was one of three university-wide recipients of funding from the ASU Foundation's Women & Philanthropy program. Read more about the ATP's work for the Governor's Recidivism Reduction Project team on our ATP projects page. Visit our blog for writings from Inside-Out course participants and Think Tank members.